Following are some terms used to identify antique bottles. Also see terms used to describe the Condition of a bottle. 3PM - 3 piece mold. Dated 1820-1880. A&DHC - A & DH Chambers glasshouse in Pittsburgh. 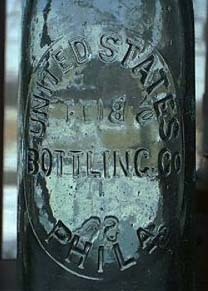 A.B.Co - American Bottle Co 1905..1916 in Chicago, IL was later bought out by Owens. ABM - Automatic Bottle Machines started 1903. Bottle made by ABM can be identified by seam that goes all the way to the top of the mouth. By 1913 most bottles were made by ABMs. ACL - Applied Colored Label, also called painted label. A.G. Co - Agnew Glassworks Company in the Midwest USA. A.G.W. - American Glass Works Ltd in Pittsburgh, PA.
Ague - chills, as in "Chills and Fever". Applied Top - blobish style; also called Blob Top. Dated 1850-1880s. See examples. Biliousness - also called "bilious complaints" is sickness caused by disturbance in the flow of bile from the liver. BIM - Blown In Mold, hand made. Can tell a bottle is BIM or BIMAL by side seams which stop before they reach the lip. BIMAL - Blown In Mold, Applied Lip. Also called two-piece mold. Dated 1850-1900. Bird Swing - strand of glass on inside of bottle that goes between two sides - a manufacturing defect (not considered damage). Here's an example on a turtle ink. BT - Blob Top - see Applied Top above. catarhh - inflammation of a mucous membrane, increasing the output of mucus: common usage, catarrh of the mouth and throat. CHATT - Chattanooga Glass in Tenn.
CLGCo - Carr-Lowrey Glass Company of Baltimore and New York was founded in 1889. See February 2001 newsletter of the Baltimore Bottle Club. consumption - cough with tightness of throat and chest. D.O.C. - D.O. Cunningham Glass Co. in Pittsburgh 1882-1937.
dropsy - short for "dropsical swellings", which are collections of water in the body. Dug - a bottle is denoted as "dug" to indicate it will have a film of water stain on the glass. Such stains can be removed with a professionally cleaning. dyspepsia - digestive type problems such as indigestion or upset stomach. FB - Free Blown means glass was blown by a glassmaker, using a blowpipe; it was not poured into a mold. Hand Finished - Bottle and lip blown in mold, then hand-finished. Dated 1890-1911. King's Evil - form of scrofula which attacks the glands in the neck, behind the ears, and under the chin. Starts as hard indolent tumours which soon rupture and become ulcers that discharge pus. Lbg - Lynchburg Glass in Lynchburg, Virginia. L.G.W. - Laurens Glass Works in Laurens, SC. MB - Mold Blown means it was blown into a mold as part of the forming process. Pontil Mark - scar on the bottom of the bottle, usually a rough circular glass mark. It was made by the punty rod that held the glass for the glassblower. If the scar was rough, it is called an open pontil; if it is smoothed out, it is called a ground pontil or refired pontil depending on which was the smoothing was done. Date pre 1850s. After the 1850's, a new type of punty rod was developed that left a mark known as a iron pontil. This mark is round and smooth and left an iron reside on the base which turned red if it rusted. See examples of the different types of pontil marks. piles - debility of the bowels due to ascarides (small white thread worms). potstone - a piece of sand/rock inside the glass that is a result of the original manufacturing process. ROOT - Root Glass Works in Terre Haute, Indiana. Was later bought out by Owens Illinois in 1930. A bottle with ROOT on it dates 1909..1932.
scrofula - swellings of the neck glands (dim. of scrofa, a sow: problem from the swollen condition of the glands). Tuberculosis of the lymphatic glands, esp. of the neck. Sheared Lip - top of bottle was cut from blowpipe with shears. Dated pre-1840. slug plate - metal plate inserted into bottle mold to provide product specific info to an otherwise generic mold. Also refers to the mark left on a bottle by such a plate. See example of strap-sided whiskey flask with embossing inside a circular slug plate. 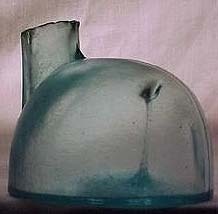 See example of bottle with embossing inside an oval slug plate. Here's a picture of the metal plate used to create the slug plate on a BROEMMEL'S PHARMACY / SAN FRANCISCO bottle. forcing the bottle to lie on its side keep the liquid in constant contact with the cork and thereby prevented the leakage of air. shape allowed it to be much stronger than conventional flat bottom bottles of equal weight so it was less likely to crack/break under pressure of the carbonation. easier to pack in crates. hard to set down an opened bottle till you finished the contents, so customers drank faster. 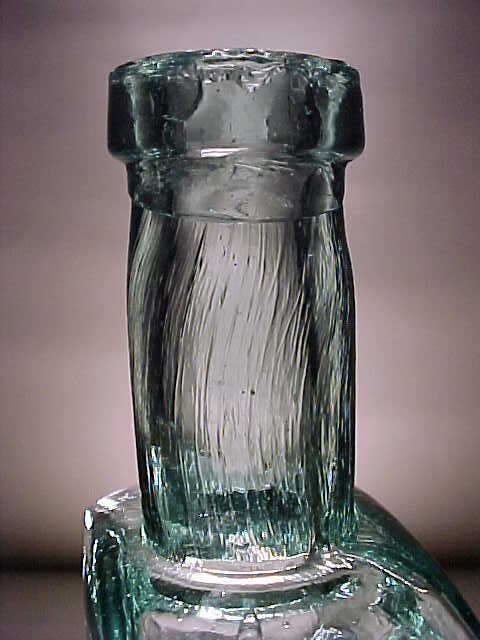 Whittled - curved line (or stretch) marks that run vertically along the neck of the bottle, caused by hand finishing of glass when lip is twisted onto the neck. See example. Wiped Top - mold lines ends before top since neck was wiped smooth after top was tooled on. Dated pre-1915.